The data collected during the event has recently been summarized, formatted and placed on the IFAO website for your perusal (www.ifao.com ). It is extremely important to understand the limitations of the data presented which goes to point number 5 above. Compaction Action was a single event, at a single point in time, under one set of field and climate conditions. Individual configurations of equipment were run across up to 4 different sensor installations from 1-3 times over the course of the two days of testing and demonstration. We were not doing research at this event, we were doing a demonstration. We did not have controlled variables inserted in the data and we did not have multiple replications. We also did not compare brands of equipment. We used various brands provided by willing and enthusiastic sponsors as platforms to compare various technologies, all of which are available across any of the brands. So Compaction Action was a demonstration that allowed us and the audience to explore different technologies and platforms to compare and contrast trends in how and why soil compaction occurs. The event pointed out what you need to consider as you try and address this “silent thief” which has been robbing us for years without us really understanding to what level. Use the data as part of a learning plan on soil compaction and the things to consider when buying new or modifying existing equipment that you want to have a lighter impact on the soil. Before reviewing the data charts on the IFAO website it is important to read the documents “Understanding Soil Compaction” and “Interpreting Data Results” available on the IFAO website. While the knowledge gained from a review of the data is valuable it should only be part of your due diligence in learning about soil compaction and making buying decisions on new equipment. 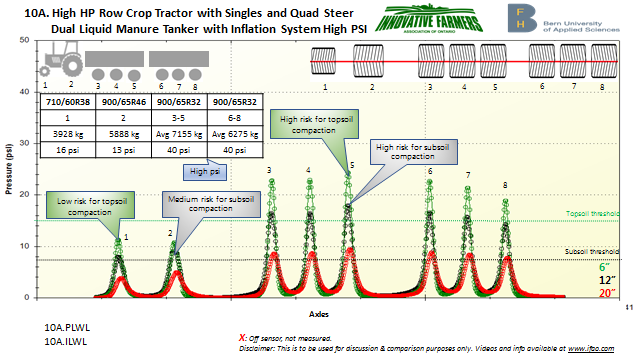 As an example from the event, a 3 by 3 axle tandem manure tanker arrangement (Figure 1) equipped with 900/65R32 tires with over 6 t/tire of weight, showed very different stresses on the soil when the tires were inflated at 10 psi compared to 40 psi (Figures 2 and 3). Obviously the 40 psi inflation pressure needed for carrying this weight on the road, is problematic in the field. Conversely, travelling on the road at 10 psi would lead to shortened tire life, probable tire failure, and difficult steering. Figure 1. 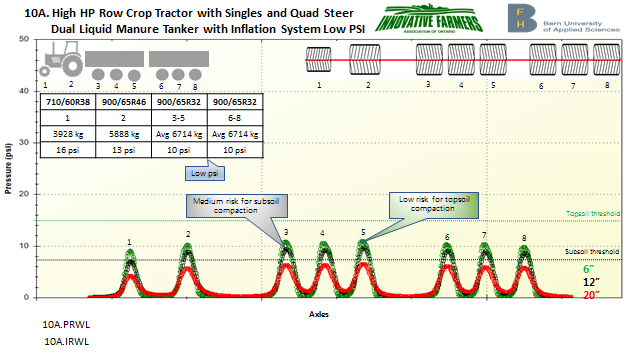 Tandem manure tanker with 900/65R32 tires with over 6 t/tire of weight, evaluated at 10 and 40 psi. Figure 2. Soil Stress resulting from manure tanker tires inflated at 40 psi. Figure 3. Soil Stress resulting from manure tanker tires inflated at 10 psi. Matthias Stettler from the Bern University of Applied Science in Switzerland has a long and well respected history in soil compaction research and extension. He was the anchor behind the Compaction Action day and employing the stress sensor technology used in the demonstrations. Matthias left us with the following take home messages to consider. 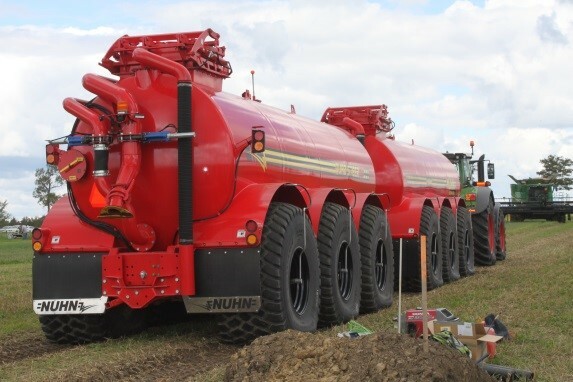 Consider central tire inflation systems that allow pressure management to optimize road and field travel. While time limitations and conditions make it difficult to avoid soil compaction, the IFAO Compaction Day showed us many things we can consider in our management decisions on how to avoid and/or lesson the severity of soil compaction. 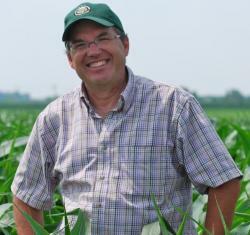 We did not address mitigating soil compaction once it has occurred. That is for another day. Additionally we are working with several partners including IFAO, OSCIA, GFO, equipment companies and OMAFRA to have the sensor technology available here in Ontario so that we can hold small and large demonstration events and research on soil compaction. To have such an event in your area or hosted by your organization please contact Ian McDonald, Crop Innovation Specialist, OMAFRA at ian.mcdonald@ontario.ca or 519.239.3473. We have a number of events already planned for this summer.